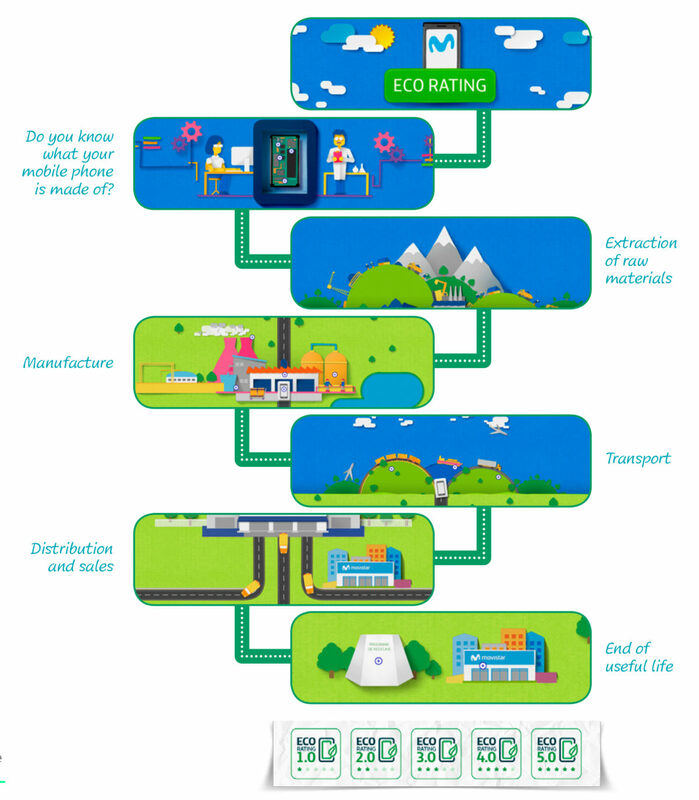 Eco Rating is a “label” that assesses the environmental impact of the whole life cycle (process of production, use and disposal) of mobile devices. The Eco-rating system promotes responsible consumption by providing information to customers about the sustainability of the different models of mobile phones, so customers can make a more environmental-friendly purchasing decision. The methodology applied to this rating, has been developed in collaboration with the British NGO Forum for the Future (https://www.forumforthefuture.org) and results in a score from 1 to 5, depending on the environmental performance of the device. This score will depend on all life cycle of the device, taking into account different criteria such as: useful lifetime, indicators like global warming, potential, and depletion of raw materials. Since its kick-off, other operators have joined the initiative and Telefónica’s goal is to make Eco rating a global standard. In this way, we evaluate, among other aspects, the design of the devices, the production of their components and substances used, the efficiency of packaging and transportation, their energy consumption, the time of full charge of the battery and its recycling. The assessment also includes the corporate policies and environmental care criteria of the manufacturers. To involve all mobile device manufacturers. To incorporate the eco-rating in the purchase decision of our customers.